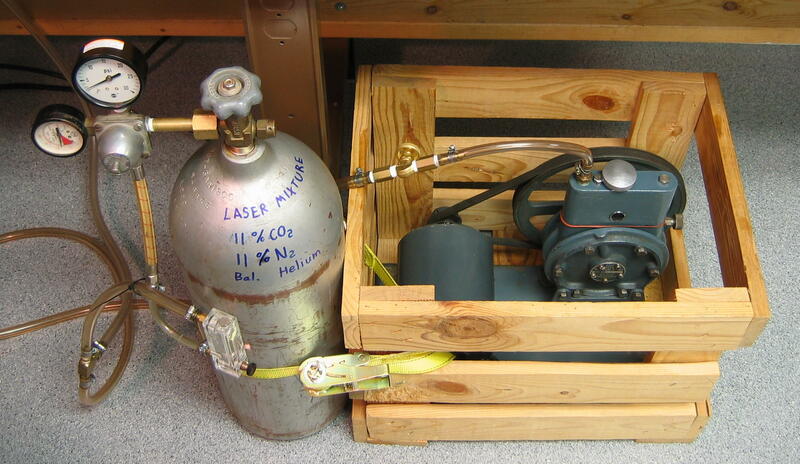 Homebrew CO2 Laser Page. Click on pictures to get larger/higher quality images. 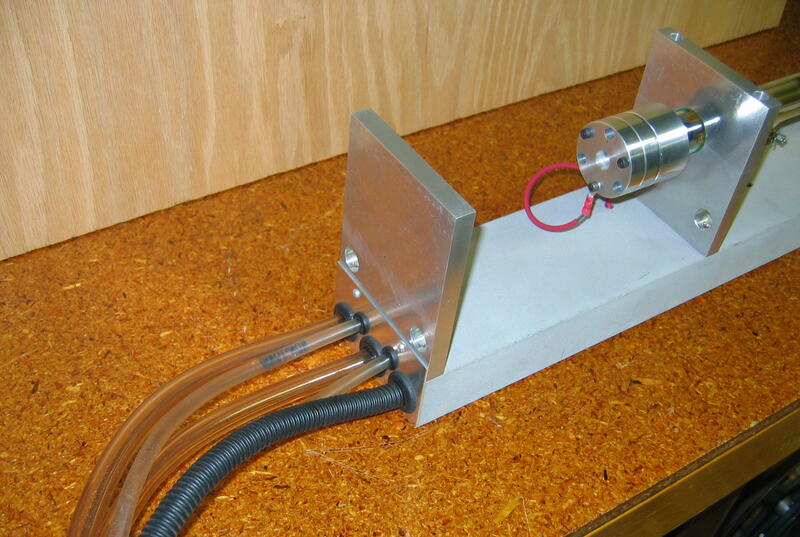 I built this laser and its power supply in 1980, as my "senior project" at school. I wrote a detailed, illustrated report describing its construction (included in the documentation below). I have made a few changes over the years. 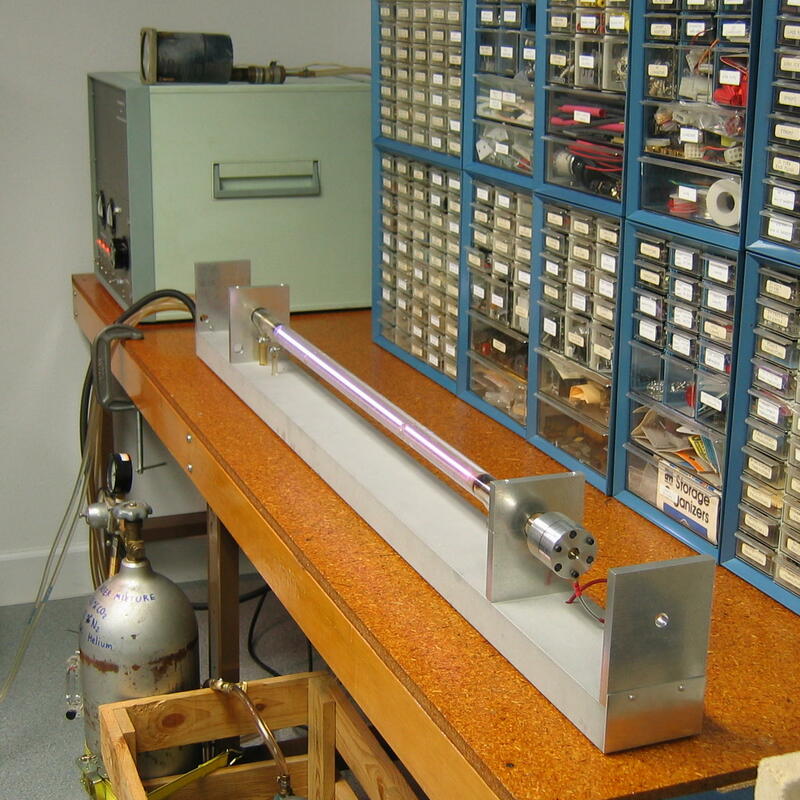 The electrical connections to the laser's electrodes originally passed out of the tube through the gas tubulations; I removed these and replaced the original electrodes (as shown in the report) with longer lengths of brass tubing that connect directly to the mirror cells. Also, I re-routed the gas tubing through the base extrusion. Finally, I have replaced the original 90%-reflective germanium output coupler (which was just a broken fragment of a larger mirror!) with a 92%-reflective zinc selenide part. I dusted off the laser after several years of disuse, powered it up, and took these pictures on July 26 and August 1, 2004. 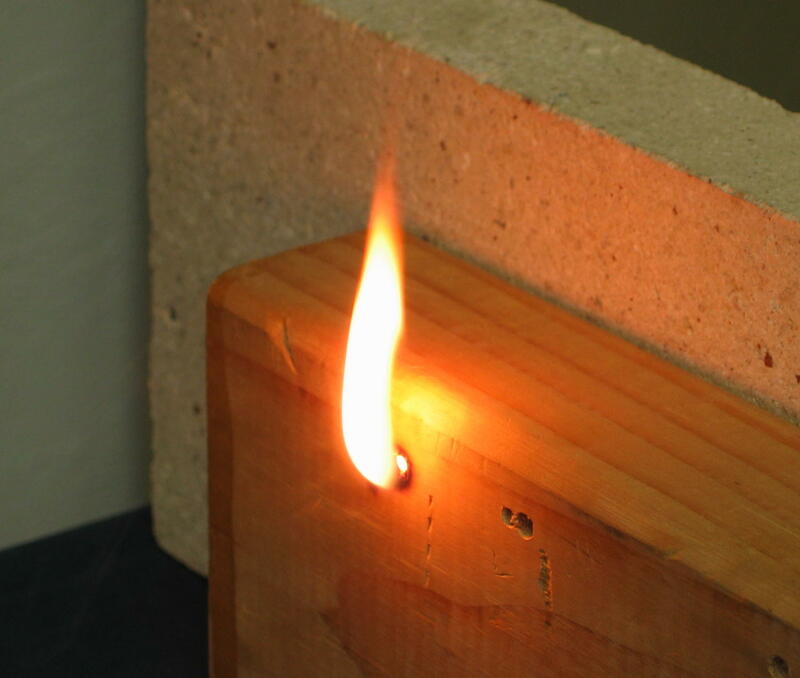 « This photo shows the laser loading 25 watts into a firebrick. 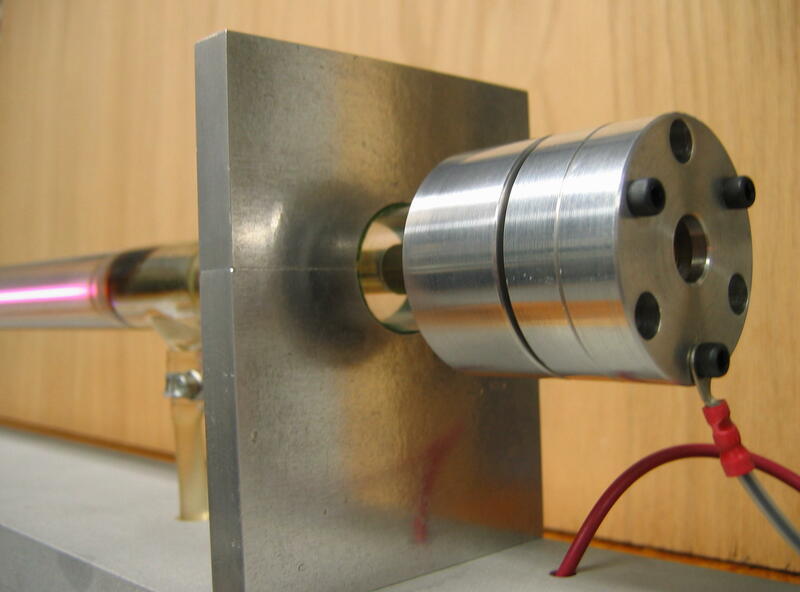 The electrical discharge down the bore of the laser tube is visible on the left. 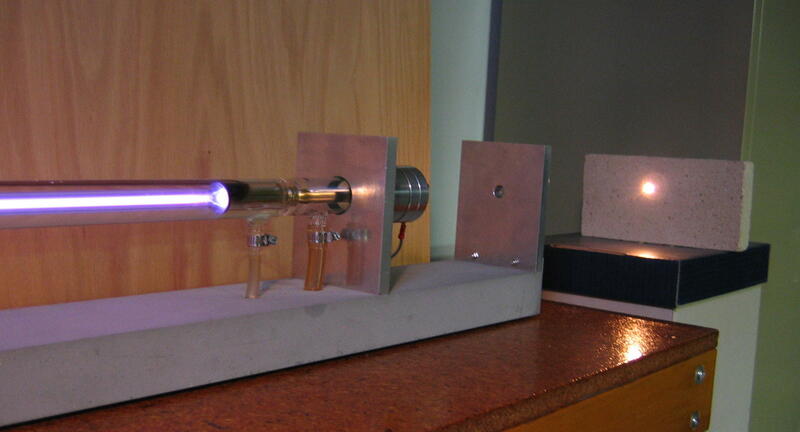 I measured the laser's output using a Coherent/Molectron handheld thermopile power meter (not shown). « Here is the whole system, sitting on my parts bench. The large green box at the upper left is the laser's power supply. « This is a close-up of the laser's "business" end. 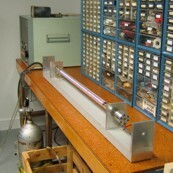 It shows the laser tube mount and the electrical connection to the mirror cell. The output coupler is just visible inside the output aperture. « A look at the laser's aft end shows how the gas, water, and electrical cabling are routed through the base and out the back. 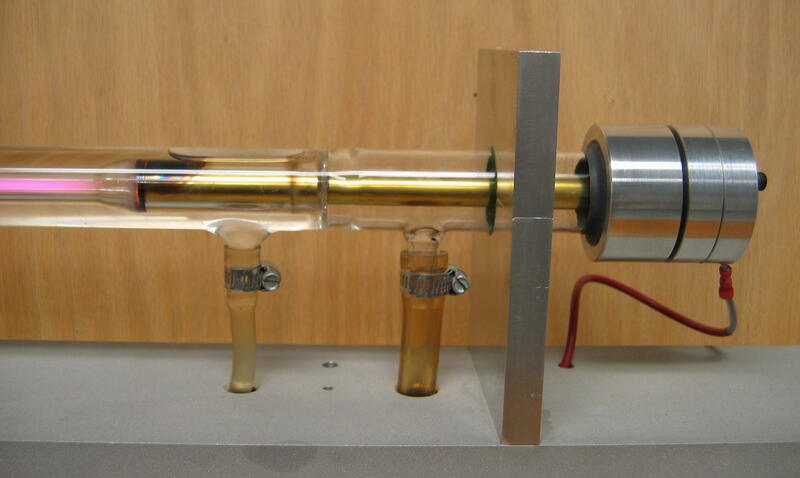 « Here is a side view of the output end that shows how the electrode is arranged, and how the mirror cell is attached to the tube. The dark smudge at the end of the electrode is a metal film sputtered by the electrode onto the inside of the glass. « With the output mirror cell partially disassembled, you can see how the output coupler is mounted and sealed. 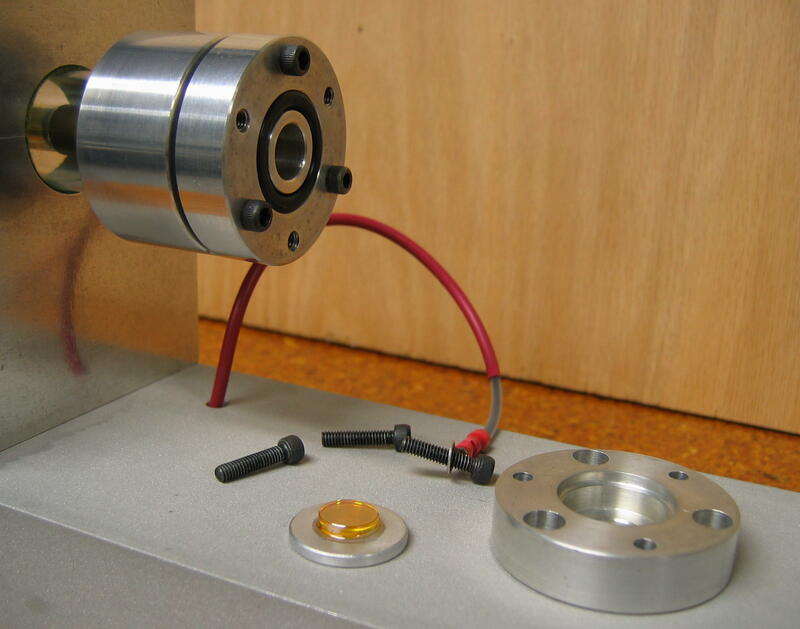 The O-ring bears against the bottom of the mirror carrier, which is held in place by the heavy aluminum end plate. 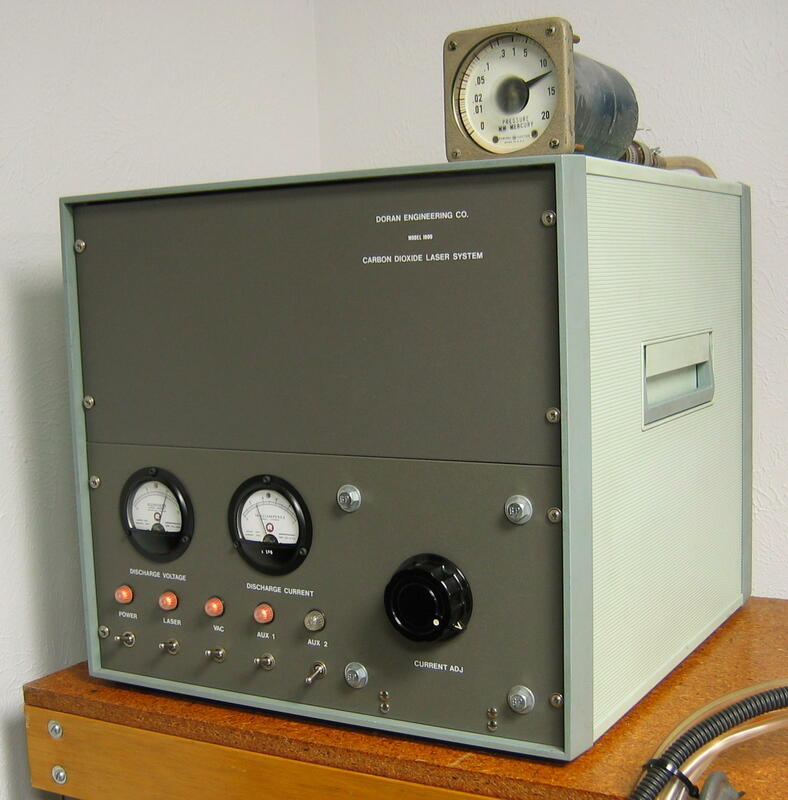 « This is the power supply, with my pressure gauge perched on top of it. It has analogue meters for measuring discharge voltage and current; and switched, rear-mounted "convenience outlets" for the gauge and the vacuum pump. 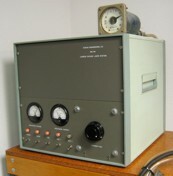 The gauge is an old General Electric "viscosity" instrument calibrated specifically for air, and so its readings of the laser gas pressure are probably too low--the mixture consists mostly of helium. « The gas handling system is simple, consisting of the gas cylinder and regulator, a metering valve (built into a flowmeter body having insufficient range! ), a throttle valve, and the vacuum pump. Documentation for the laser follows. All docs are in Adobe PDF format, except those specifically indicated otherwise. the laser itself, and the schematic diagrams for the power supply. laser_design_notes (HTML) CO2 Laser Design and Construction Notes. warnsign An ANSI-standard CO2 laser warning sign for the lab.